The storm that dumped over a foot of snow from Washington to Colorado over the past two days is continuing to push east on Thursday. Numerous states from the east to west are under flood, snow and high wind alerts. 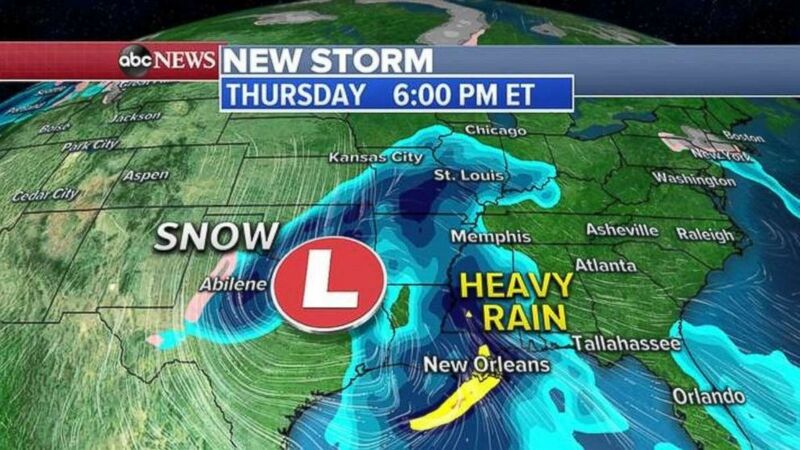 The storm system will move into the Southern Plains on Thursday, bringing heavy rain and storms ahead of it, from the Gulf Coast into the mid-Mississippi Valley. A few of the storms could become severe with damaging winds, hail and even an isolated tornado. Flash flooding is also possible. Heavy rain will move into the Deep South on Thursday evening. The storm system will not move much on Friday, but the rain ahead of it will spread into the Southeast — the areas that just got hit with heavy snow and ice last weekend. Damaging winds, hail and a few tornadoes — as well as flooding from heavy rain — are possible from Florida to the Carolinas. 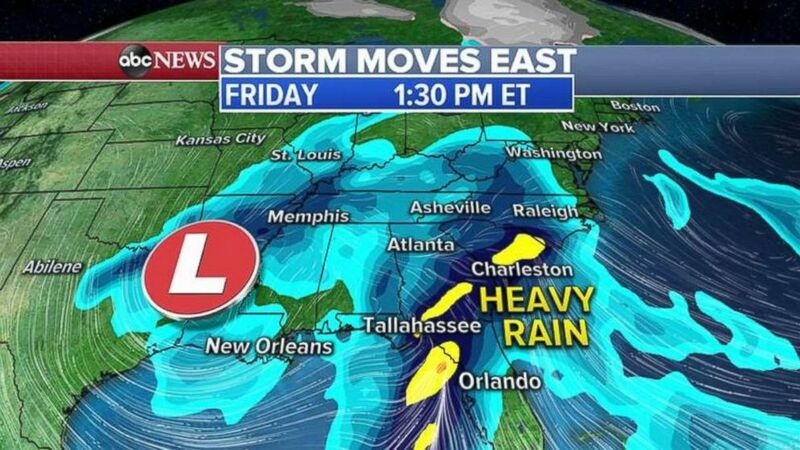 The rain will not move much by Friday, as the Southeast starts to feel its effects. 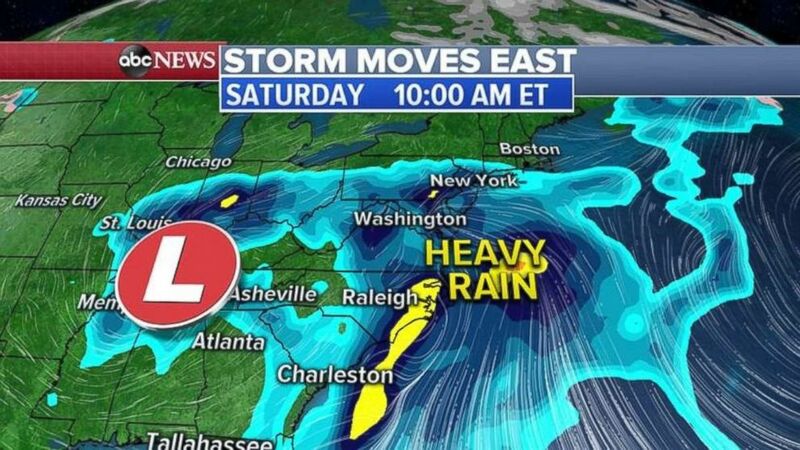 The heavy rain moves up the East Coast into the Mid-Atlantic on Friday night into Saturday morning and into the Northeast by Saturday afternoon. Some flash flooding is possible from the heavy rain. The heavy rain will move up the East Coast on Saturday morning and into the Northeast by afternoon. 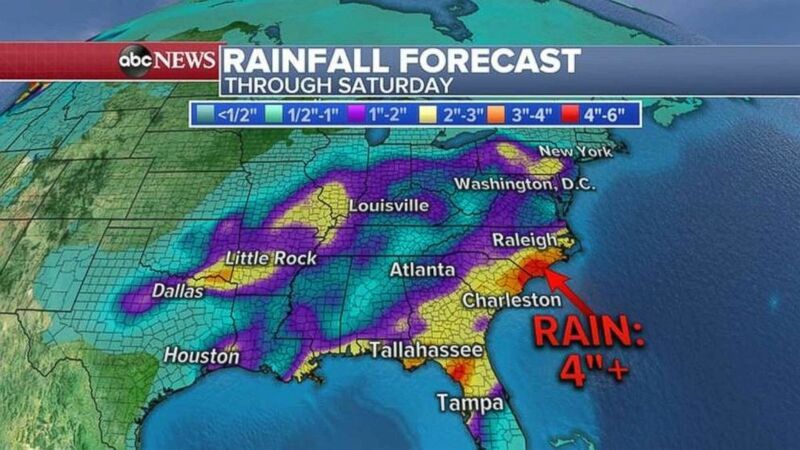 Some areas from northern Florida to the Carolinas could see more than 4 inches of rain as the storm moves through the eastern U.S.
Rainfall totals will be highest in the Southeast from northern Florida to North Carolina.